Think you have carpenter ants? Any large, dull black ant seen in New Jersey is likely to be a carpenter	ant. The largest ant species in the U.S., black carpenter ants are ¼	to ½ inch long. These ants are named for their ability to carve large nesting galleries	out of wood, leaving hollow tunnels and spaces that threaten the structural	integrity of buildings and wooden structures and can eventually cause	their collapse. 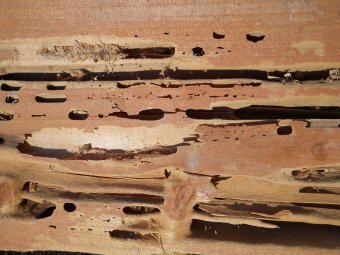 Unlike termites, carpenter ants do not ingest wood. They	tunnel into soft, water-damaged wood to create transportation corridors	and larger galleries in which to build their nests; however, they will	tunnel into healthy wood to expend their nests. Like Termites, carpenter ants live in large social colonies governed by	strict caste systems that can number in the tens of thousands. Primarily	night foragers, carpenter ants lay down pheromone trails to guide workers	to new nesting sites and food and water resources. Carpenter ants may	forage over an area the size of a football field. Then enter homes through	door and window frames, along plumbing and utility lines and over landscape	bridges formed by tree limbs and overgrown shrubs. Omnivores and adept scavengers, carpenter ants will eat nearly anything	humans eat but primarily feed on sweets, particularly aphid honeydew,	and proteins, including other insects and their own dead. From March through	May, established carpenter ant colonies produce flying swarmers. The mated	pairs fly off to begin new colonies. 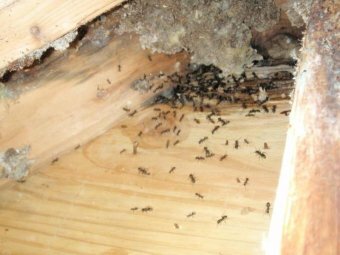 Because carpenter ants require constant	water access to survive, they are drawn to damp, decaying wood. Outdoors	carpenter ants nest in damaged trees, favoring maples and oaks, old stumps	and wood piles. 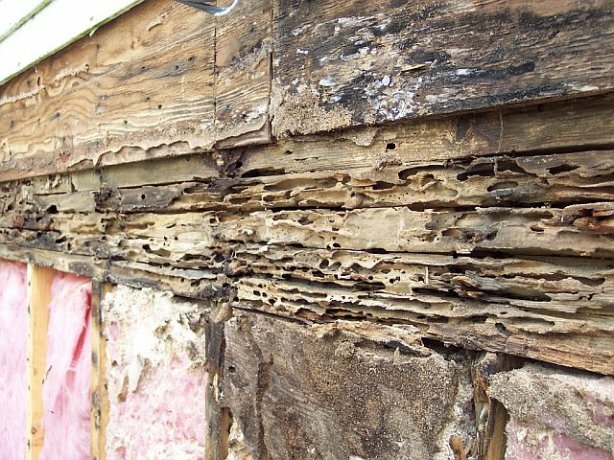 Satellite colonies may more indoors into high moisture	areas such as damp wall cavities, under water-damaged roofs and inside	porch pillars or window sills. Their presence is often discovered by the	telltale piles of sawdust-like byproduct these ants deposit during tunneling. The original parent colony is usually located outdoors with multiple satellite	colonies in the vicinity. To effectively eliminate carpenter ants and	halt the structural damage they cause, the entire colony and all its satellites	must be exterminated.